So many chateaux, so little time. With more than 500 chateaux in the Loire Valley, where does one start exploring this region which has been called the garden of France? 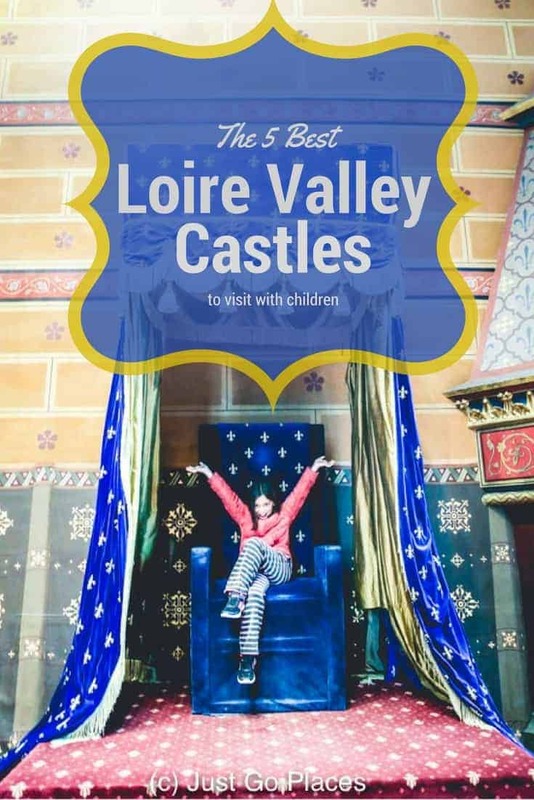 Having been to the Loire Valley a few times, we decided to narrow down the geographical area we would visit on our first trip to the area with the kids. We focussed on the area between Blois (the first chateau you meet when you come from Paris) and the city of Tours. 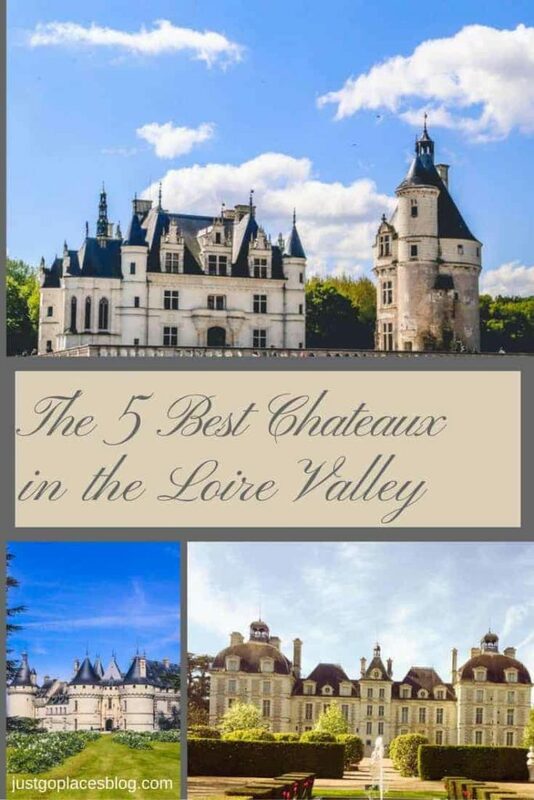 Within this limited area, you will find plenty of sightseeing, including (in our opinion) the five best chateaux in the Loire Valley. It also helps that these chateaux are family-friendly! 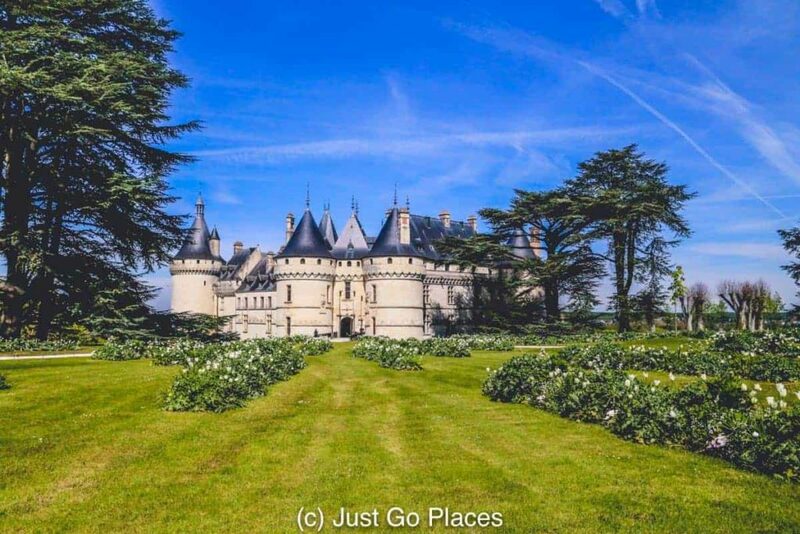 1 Why Are There So Many Chateaux in the Loire Valley? Why Are There So Many Chateaux in the Loire Valley? 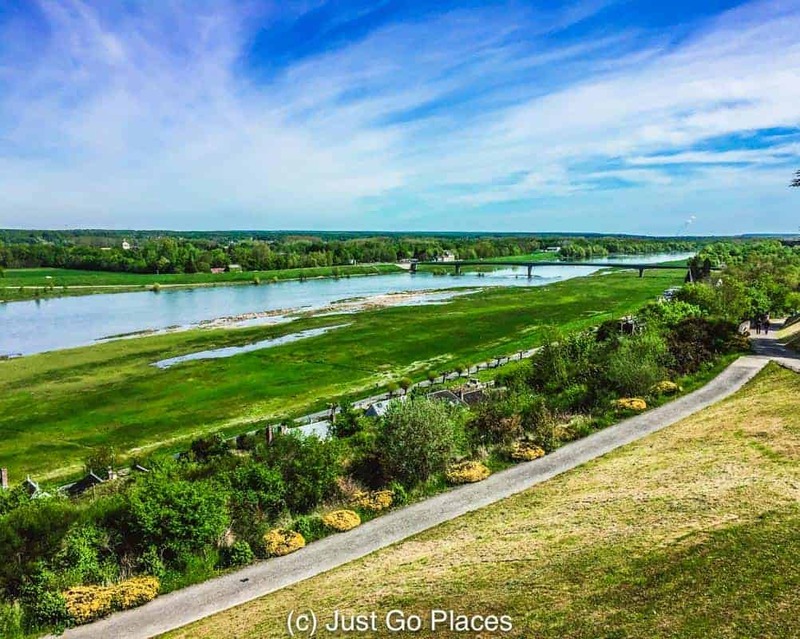 Running for approximately 1000 kilometres, the Loire is the longest river in France. This part of the Loire Valley has been recognised as a UNESCO world heritage site for its historical significance, charming towns and pretty chateaux. The Loire River runs for about 1000 kilometres in France. During the 100 Years War during the 14th and 15th centuries, the Loire valley was strategically important to the French and fortified against the English. After the battle of Agincourt in 1415, the English were in control of Paris. The French did not regain control of Paris again until 1436 but the King of France decided to remain with his court in the Loire Valley. 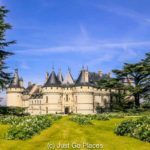 There are so many chateaux to visit in the Loire Valley that it’s hard to know which ones to choose. The French monarchy felt Paris was an unpredictable capitol. After all, it was the Parisians who had given Joan of Arc to the English to be executed. Considering the subsequent history of the French Revolution, the kings were right to be wary of the Parisians. In any event, where the king went, the aristocracy followed like lemmings. They, too, built chateaux around the Loire Valley so that they could be near the king and the good gossip. You wouldn’t be in the Loire Valley unless you were planning on visiting at least one French castle. The ancient Cathedral town of Tours is a convenient place to divide the Loire Valley if you are limited on time. 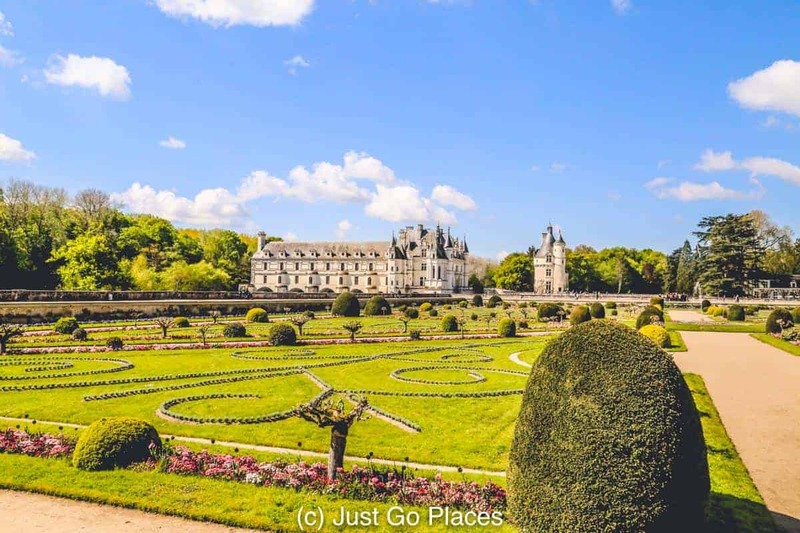 With a cluster of chateaux on each side of Tours, each chateaux cluster has winners for attractiveness and gardens. Tours is also a good transportation hub with trains and a small airport. As this map shows, these castles are relatively close to each other. 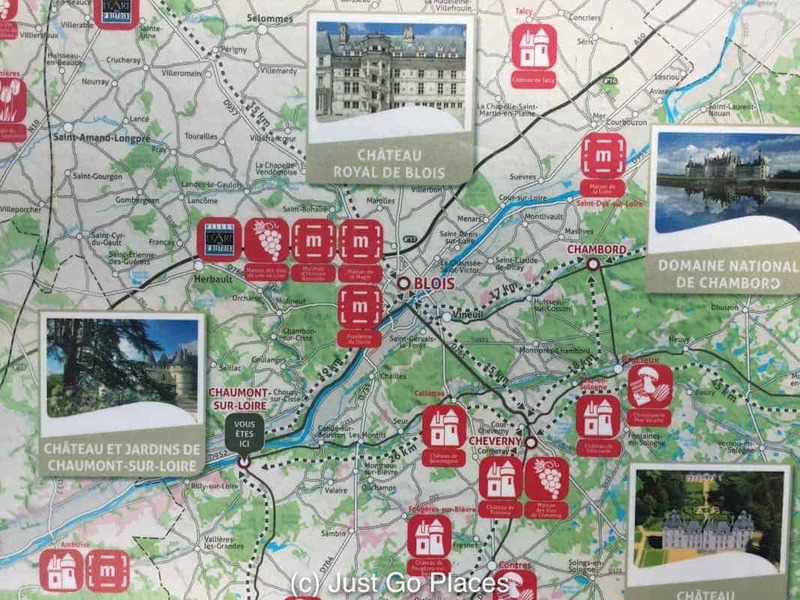 The Loire Valley tourism board has different types of chateaux passes depending on how many castles you want to see. The 5 Chateaus mentioned below are on their Chateaux Pass No. P which we felt was the maximum our children would visit without open revolt. We stayed near Cheverny and all of these castles are an easy driving distance from each other. Chateau de Chenonceau is one of the most visited of the castles in the Loire Valley. 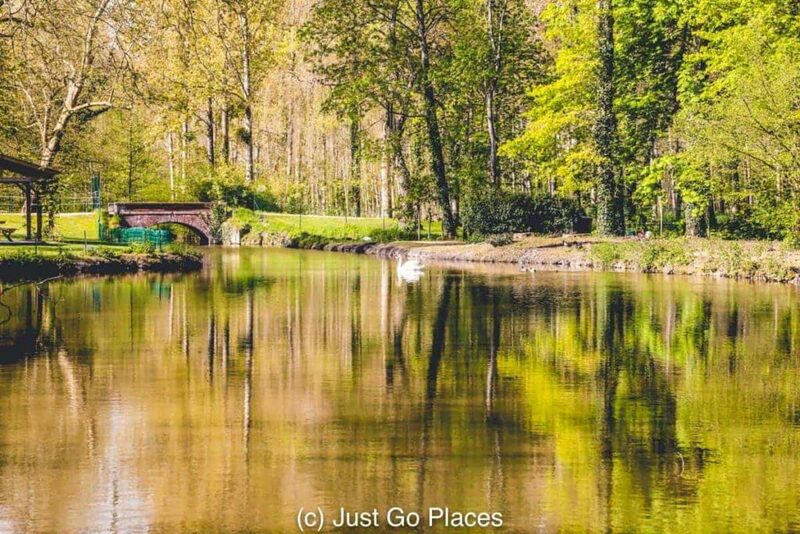 Spanning the River Cher, it is beautiful and has extensive gardens. During its heyday, it was caught in a royal love triangle between Henri II, his mistress, Diane de Poitiers and his wife, Catherine de Medici. The gardens and chateau de Chenonceau are both beautiful. 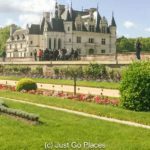 For kids, Chenonceau is fun to visit because it is a small chateau with pretty gardens and a garden maze. There is a handy restaurant as well as a little creperie. You can take boat rides or hire kayaks to go along the river. The Chateau Royal de Blois was the home of 7 French kings and the centre of a lot of intrigue. Built around a courtyard, each wing has a different type of architecture – Gothic, Renaissance and Classical. Catherine de Medici (she who loved Chenonceau so much) died in the Queen’s Chamber at this chateau in 1589. You can see her study with the secret compartments where she supposedly kept her handy supply of poisons. One of the facades of the Chateau de Blois. For children, Blois has a throne they can sit upon and plenty of random things to examine. Francois I liked to put his salamander seal everywhere. My kids went around the castle playing find the salamander. The chateau also has a great sound and light show in the evenings and is located across the square from the highly-recommended family-friendly Museum of Magic. Someone really liked being a pretend French queen. 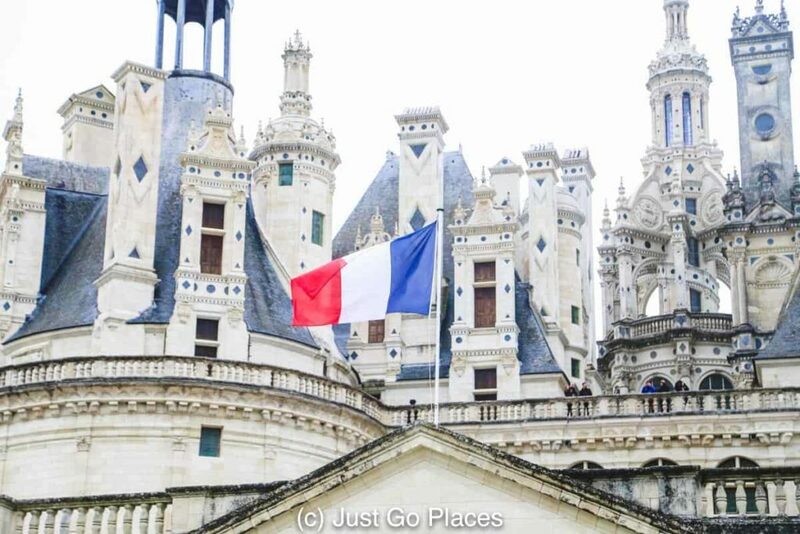 Chateau de Chambord is the largest of the Loire chateaux with 440 rooms, 282 fireplaces and 84 staircases. The most famous of these staircases is the double helix staircase attributed as a design of Leonardo da Vinci. Built at the behest of Francois I as a hunting lodge, he used it for approximately 7 weeks during his reign. For much of its life, the chateau has lain empty because such a massive structure was hard to heat and impractical to live in. 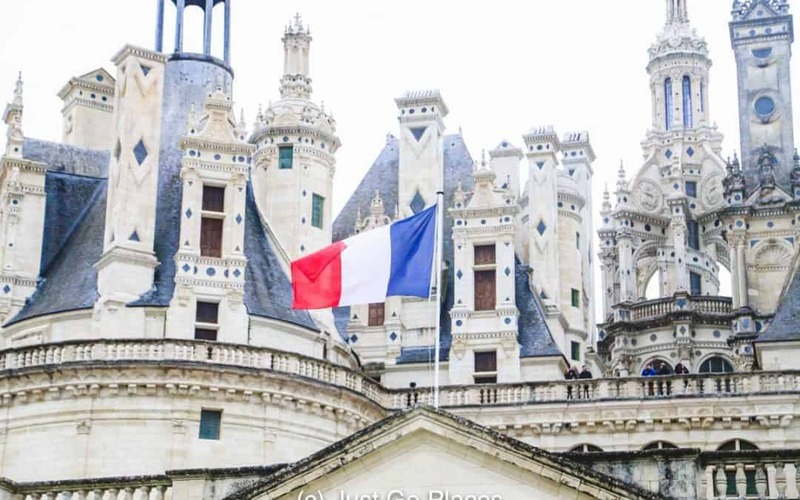 The French Tricolor flag flies high amounts the many chimneys of Chambord. 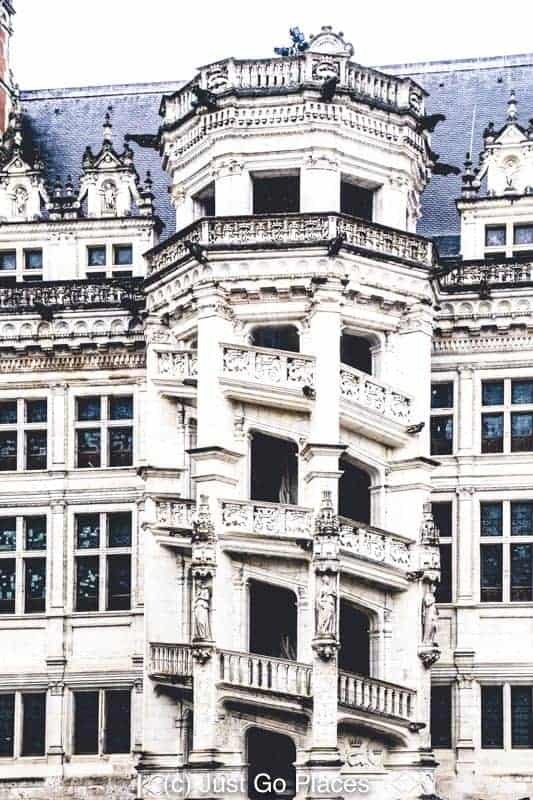 For children, the highlight of Chambord will be climbing up and down the double helix staircase and walking around the rooftop of the chateau with its hundreds of chimneys (all those fireplaces had to lead somewhere!). Chambord also does regular pageants on its grounds which are geared toward showing children court life during medieval times. 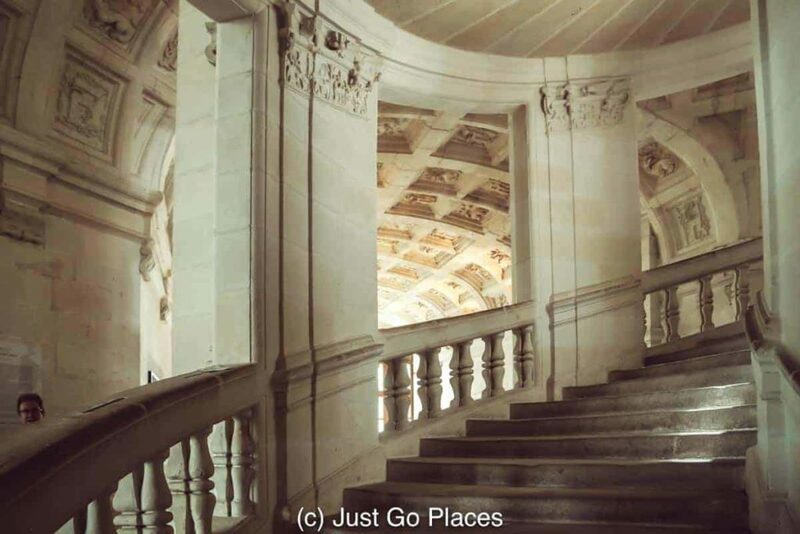 The double helix staircase at Chambord supposedly designed by Leonardo da Vinci. You can climb up one set of stairs and another person can climb down the other set of stairs. Neither of you will pass each other. The chateau de Cheverny is still inhabited by the family that built it in the early 17th century. When Diane de Poitiers got ejected from Chenonceau by Catherine de Medici, she was housed at Cheverny until she was finally given Chaumont. It’s not bad for temporary housing! You may recognise the middle portion as the model for the chateau that appears in The Adventures of TinTin. The centre part of the chateau de Cheverny is the model for the chateau in the Adventures of TinTin. This chateau is not very big but it is an excellent example of how the aristocracy would have lived. It is light, bright and well-furnished. You get the sense that a real family would have lived in this chateau. The royal chateaux leave you with a sense of grandeur but feel cold and barren. My children liked walking in the pretty gardens and watching the French hounds in their kennel. 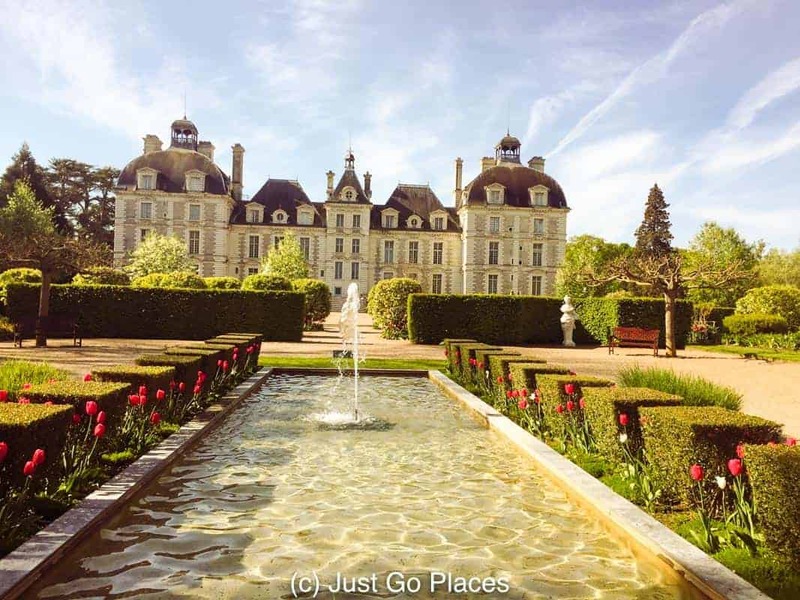 Cheverny has regularly scheduled tours through its gardens as well as plenty of places to picnic or just sit down. The Chateau du Chaumont is the home Diane de Poitiers eventually received from Catherine de Medici after being turfed out of Chenonceau. This chateau has beautiful gardens especially if you are skipping Villandry which is well-known for its gardens. The Chateau itself is full of dark furniture from the 19th century . The grounds are well-landscaped with a fabulous view of the Loire valley. The relatively small chateau de Chaumont is perched on a cliff with a view of the Loire Valley. Every summer, Chaumont has a well-known international garden festival which is very family-friendly. Weird garden design to explore – what’s not to love?? We all loved the garden festival and could easily have spent the entire day exploring it. We stayed at the Relais de Trois Chateaux which is a 4 star hotel in Cour Cheverny. The family room has a separate room for the children. Although the rooms are compact (you would think you were in Paris), they are beautifully decorated. We shared one bathroom but each room had its own television. Priorities, right? If you would like to stay in a chateau itself, there are several chateaux hotels in the Loire Valley. The boutique hotel was small but stylish. There is no lounge/reception area worth mentioning at this hotel so you are either on your bed in your hotel room or not at the hotel. There is plenty of parking. The WiFi is excellent. The hotel restaurant, Les Trois Merchands, is very popular in the evening and very good. Located in the tiny village of Cheverny, you are pretty much outside the walls of the Chateau de Cheverny. 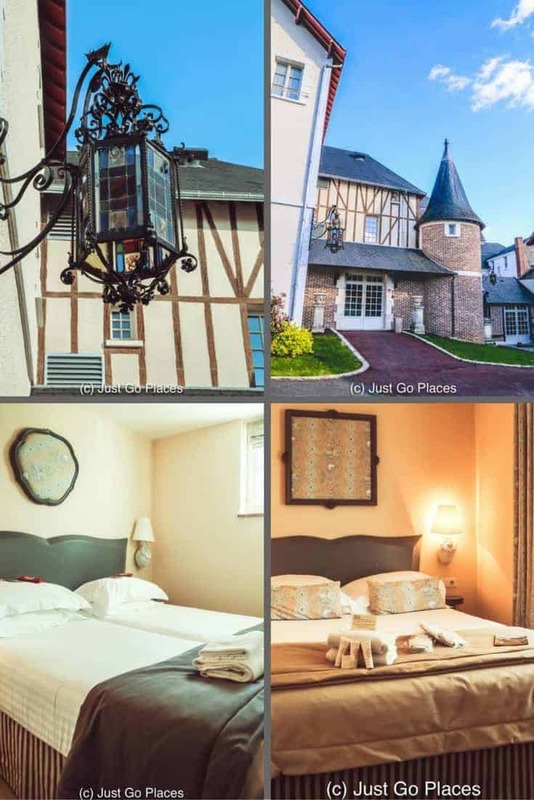 You can buy the Chateaux-Pass online which should save you some time. Otherwise, you can buy it at the local tourist office of Blois, Cheverny, Chambord or Chaumont. Keeping in mind that French tourist office hours may not align with your expectations, you can avoid disappointment by just buying it ahead of time. My husband and I have visited the chateaux on the other side of Tours on previous trips. Azay-le-Rideau is considered a masterpiece of the French Renaissance but has been undergoing renovation the last couple of years. Chateau du Villandry is best known for its French-style gardens (nothing as kooky as you find at the Garden Festival at Chaumont). According to legend, while staying at pretty Chateau d’Usse, Charles Perrault was inspired to write Sleeping Beauty. With Azay-le-Rideau under scaffolding, much of its beauty as a chateau surrounded by water is marred. I personally think Chenonceau is prettier if you are comparing betweens chateaux-on-water. 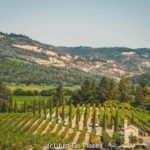 If you have the time (and willingness) this cluster of chateaux is worth exploring, too. Note: This story includes affiliate links. Your clicks, purchases and bookings do not cost you any extra. I love this area of France. I’m glad you incorporated so much history into the post. All of them would be great to see, but I think I’d really like to see Cheverny the most! Cheverny is the most relatable and overall winner for pretty inside and out. Each looks so great. I would love to know which palaces didn’t make the cut. And I love how Catherine is tied into so many of them. Catherine de Medici was the wife of 1 King, mother to 3 kings and mother in law to yet another King. 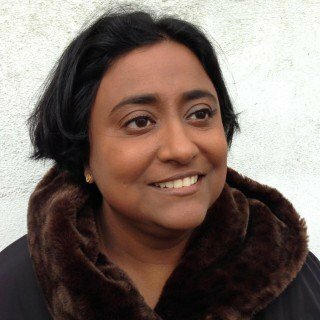 She was a formidable not-so-behind the scenes power to a lot during a long period. Nice post, my favorite chateaux in the Loire Valley is Chenonceau. I love how it sits over the river. Great post! Chenonceau is indeed very pretty! They transport you to another era! Can’t imagine the upkeep costs. On my first ever trip to Europe, when I was 11, my parents, my two sisters and I visited all of these chateaux, plus a few others. That’s what led me to take French in school; I fell in love with France and fully expected to live there eventually. It didn’t turn out that way, but the chateaux of the Loire Valley are high on my list of places I recommend to people deciding where to visit. 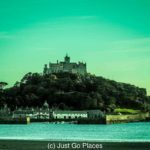 There really are too many places in the world to visit! I have an endless bucket list. One of our favourite towns in the Loire Valley was Loches and the troglodyte homes. You are so right about our world having so many outstanding sights to see! I also love Loches which is truly a quintessential Loire Valley town. Le Château is quite unique along with the legend of Agnès Sorel who dwelled therein. I also like Angers, Blois, Remoulins, and most especially Les Châteaux de Moulins, Usse, Villandry, Plessis- Bouree, and Azay-Le-Rideau. The list could go on and on! Wow! You’ve explored a lot of the area! Yes, true, I have been fortunate to have traveled to many places around the globe. I have spent more time in France over the years than any other European nation and explored / driven through every region of the country. I have spent the most travel time in China where Fir the past ten years I lived there 7 months of each year. Also have spent a lot of time in Thailand, Hong Kong, England, and Switzerland. Cheers and happy travels to you! You too! 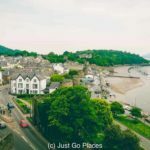 Hubby and I want to do long term travelling once we get the kids out of the house. Thanks! Of course I had an advantage – no kids and being a travel photographer working for myself I could go anywhere I wanted any time I so desired. Tough, huh! Beautiful places and your opening line had me. The fact that there are so many chateax itself is amazing. Chambord is really cool from your list. Sigh! Some day Some day! Lots of them survived in great condition. After the 100 years war, it helped that that portion of France wasn’t really the frontline of any boundary conflicts.